Easter Swirled Chocolate Cheesecake – – dried activated almonds (see directions below) (use regular almonds otherwise), cashews, pitted dates, coconut flakes/ desiccated coconut, vanilla bean powder, himalayan salt, melted coconut oil, cacao powder, water (optional), Filling: soaked cashew nuts ((Or sub 1 slab silken tofu for 1 cup cashews to give a lighter cake)), cups almond milk, maple syrup/ agave syrup, vanilla extract, pinch of salt, powdered agar agar ((to set the cake but it will set in the freezer without this)), melted coconut oil, melted cacao butter, juice of half a lemon, cacao powder, 8 hours before you plan to make the cake place your cashew nuts (3 cups) in a bowl and allow to soak to remove the phytic acid. Cashews should be soaked for at least 3 hours. Then drain them and rinse them in fresh water. ; To activate your almonds- soak them for only 2 hours- and then drain and rinse, and put them either in a dehydrator to dry at 40°C for a couple of hours, or in the oven at the lowest heat for an hour. ; Line a 22cms spring-form cake tin with baking paper for easy removal. ; Make the base- pulse nuts and dates together in a food processor until a sort of couscous look is achieved. Add in all other ingredients and pulse together- if the mixture looks a bit dry and does not ‘come together’ then add some extra water- it will depend on how juicy your dates are as to how much water you might need to add. Put the mixture in your cake tin and press down with the back of a spoon to even it out. Place the base in the fridge while you make the filling. ; Add all the ingredients on the list up to the agar agar to your high speed blender and blend until you have a super smooth mixture. ; If using the agar agar, dissolve the powder in a very small amount of cold water and then pour a small amount of boiling water into it. Give it a stir. Add the mix to the blender and give it a few seconds of blending. The agar agar thickens the cake as it cools down so it does have to be hot to start with. ; Now gradually add in the melted liquids with the blender running, until they are all well incorporated. ; Pour half the mix into a bowl and to this half add the juice of half a lemon and give it a good stir. ; To the half in the blender add ¼-1/3 cup cacao powder depending on how chocolaty you like things, plus the extra ¼ cup of almond milk. Stir the powder in a bit before you start the blender- otherwise you may end up with a puff of powder over you- blend until all is smooth and well mixed. 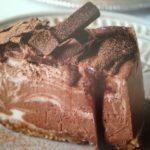 ; Now take the chocolate blend and pour it on top of the white blend in the bowl and with a spoon swirl the two together. I like to add just half the chocolate mixture and swirl and then add more- you mustn’t swirl too much otherwise you will end up with an all over light chocolate cake! Still tastes delicious however! ; Pour the swirled mix into the cake base and leave in the fridge to set for a few hours if using the agar agar or in the freezer if not- it will take a couple of hours. ; If you have a frozen cake then remove from the freezer an hour before you wish to serve it! ; – Top your cake with <a href="http://theclever.kitchen/recipe/chocolate-bark-topping/">Chocolate bark</a>, and if you want to be really decadent pour some <a href="http://theclever.kitchen/recipe/chocolate-sauce/">chocolate sauce</a> on it. 8 hours before you plan to make the cake place your cashew nuts (3 cups) in a bowl and allow to soak to remove the phytic acid. Cashews should be soaked for at least 3 hours. Then drain them and rinse them in fresh water. To activate your almonds- soak them for only 2 hours- and then drain and rinse, and put them either in a dehydrator to dry at 40°C for a couple of hours, or in the oven at the lowest heat for an hour. Line a 22cms spring-form cake tin with baking paper for easy removal. Make the base- pulse nuts and dates together in a food processor until a sort of couscous look is achieved. Add in all other ingredients and pulse together- if the mixture looks a bit dry and does not ‘come together’ then add some extra water- it will depend on how juicy your dates are as to how much water you might need to add. Put the mixture in your cake tin and press down with the back of a spoon to even it out. Place the base in the fridge while you make the filling. Add all the ingredients on the list up to the agar agar to your high speed blender and blend until you have a super smooth mixture. If using the agar agar, dissolve the powder in a very small amount of cold water and then pour a small amount of boiling water into it. Give it a stir. Add the mix to the blender and give it a few seconds of blending. The agar agar thickens the cake as it cools down so it does have to be hot to start with. Now gradually add in the melted liquids with the blender running, until they are all well incorporated. Pour half the mix into a bowl and to this half add the juice of half a lemon and give it a good stir. To the half in the blender add ¼-1/3 cup cacao powder depending on how chocolaty you like things, plus the extra ¼ cup of almond milk. Stir the powder in a bit before you start the blender- otherwise you may end up with a puff of powder over you- blend until all is smooth and well mixed. Now take the chocolate blend and pour it on top of the white blend in the bowl and with a spoon swirl the two together. I like to add just half the chocolate mixture and swirl and then add more- you mustn't swirl too much otherwise you will end up with an all over light chocolate cake! Still tastes delicious however! Pour the swirled mix into the cake base and leave in the fridge to set for a few hours if using the agar agar or in the freezer if not- it will take a couple of hours. If you have a frozen cake then remove from the freezer an hour before you wish to serve it! Top your cake with Chocolate bark, and if you want to be really decadent pour some chocolate sauce on it.